Thanks to a partnership with Deep Silver, 11 bit studios' tale of true survival is coming to PlayStation 4 and Xbox One on January 29. 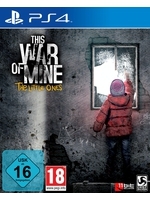 This War of Mine: The Little Ones contains all the PC content and new campaigns, new missions, new characters. Larkspur, Calif. – August 27, 2015 – Critically acclaimed and globally lauded title This War of Mine will arrive on consoles next year, as developer 11 bit studios and publisher Deep Silver announced today that This War of Mine: The Little Ones will arrive on January 29 on PlayStation®4 computer entertainment system and Xbox One, the all-in-one games and entertainment system from Microsoft. Featuring every piece of content from the celebrated PC version, This War of Mine: The Little Ones is set to challenge and inspire gamers with new missions, new campaigns and new characters. New content coming to consoles in This War of Mine: The Little Ones explores the hardships of wartime survival as seen from an entirely new perspective – that of a child. Based on This War of Mine, The Little Ones focuses on the reality of enduring war and the idea that even in war, kids are still kids - they laugh, cry, play with toys and see the world differently. In addition to thinking about survival, you'll have to bring back the kid in yourself to understand how to protect the little ones. How far will you go to make it through another day? Protect and take care of The Little Ones as they continue to live in the war torn landscape as only children can. Teach, educate and form emotional bonds as you fight to survive in this harsh world and prevail through this unique narrative. Michal Drozdowski, creative director at 11bit studios said, “We had this idea from the very beginning and when Deep Silver provided an opportunity to make a console version, we decided to expand our project and bring our ideas to life. We're excited to showcase this at this year's PAX Prime." Learn more info at www.thiswarofmine.com . Great game. Have play some on PC and it can be fun.